When we purchased our farm on Colorado’s western slope in 1992, it was like most ranches and farms in the region: “just plain worn out.” Hay was cut each year and cows turned back on it until the snow covered the ground. Manure was harrowed in, lots of N-P-K added annually and the cycle started over. This had been going on for approximately 50 years! We quickly realized that the process was far from sustainable. That’s what drove us to soil biology and fish fertilizer in Colorado. We became biological farmers who manage our soil microbiology for better crops and produce. Our harvest has increased dramatically and just keeps getting better! We didn’t immediately set out to become the best fertilizer supplier in Colorado. In fact, we started small. Our neighbors looked over the fence at our hay field the first year we applied Liquid Fish and immediately wanted the same results in their fields! From there, word spread quickly and the results spoke for themselves. Today, we’re the premier provider of organic fertilizer in Colorado, carrying biological and trace element products that will increase soil production and improve the quality of your farm. We even assist with community supported agriculture farms and offer farm visits, to educate people on how to grow the best food and forage! All our products are certified or NOP listed. They can be used for organic, sustainable, or conventional crop production. We’re a proud member of the Valley Organic Growers Association and support VOGA’s mission to promote sustainable agriculture in Western Colorado. We do not deliver or provide containers; however, we can drop-ship tankers to your farm. Whatever size container you bring to our farm we can fill it! We specialize in soil microbiology and constantly strive to improve the formulations of products we offer. We’re the only bulk provider of fish fertilizer in Colorado situated on the Western Slope! 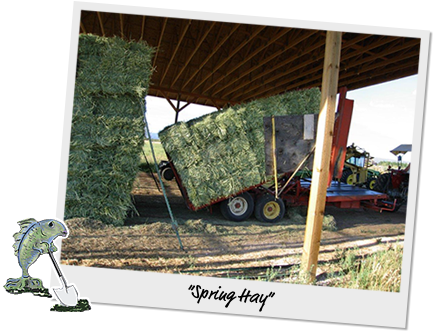 When we tried to raise “horse hay” — alfalfa-grass hay — we were lucky to harvest .5 ton per acre per cut, now we harvest 1.5 tons, three times as much per cut. The soil samples we first took showed that our soils had nothing left for the next season’s growth cycle. Commercial fertilizer recommendations were for hundreds of pounds per acre of NPK, and 5-7-10 pounds per acre of trace elements, just to keep things growing. Our primary customer base is for horses and field is 70% grass, 30% alfalfa. We try to keep our crude protein below 18% with averages 14%-18%. Some of our hay has tested at 21%. These past few years our TDN (total digestible nutrients) has come up to 78.4% and 161-262 relative feed value. Trace elements are well above average.